After a ten-year marathon of inspecting, buying, rehabbing, and selling 53 units of buy-and-hold rental real estate, we've written a book about the process & assembled a collection of great tools. My name is Ken LaVoie, and with the help & inspiration from the love of my life, Deb, I wrote this book about getting started in buying & managing rental properties, after writing a chapter for the BiggperPockets.com book "Real Estate Rewind". I'm not a guru, and I've never made a fortune, lost it, and made it all over again. If you dropped me in the middle of the desert with a calculator and a Rolodex, I wouldn't re-create Las Vegas; I'd simply keep some vultures well-fed for a few hours. I only had one dad and he was neither rich nor poor. I'm simply an ordinary man who felt he wanted more control over his financial life after the financial crisis in 2008. I've had some successes and screw ups, and I've learned a lot. Enough to write a book, some might say, and so I have. 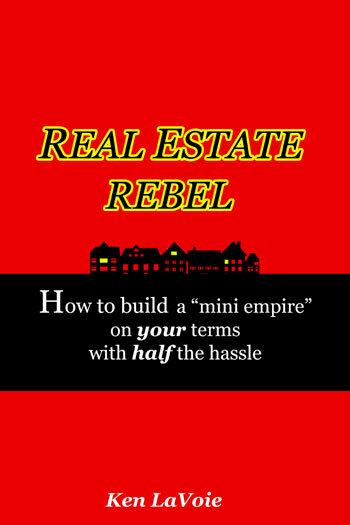 I named the book Real Estate Rebel for a couple of reasons. First, my foray into real estate investing was a rebellion against the stock market. I wanted more control over our nest egg after it shrunk 35% in 2008. Furthermore, the way I went about the whole process was a bit rebellious: I built our real estate portfolio in 3 years instead of a more reasonable 10 or 20. We bought rental properties that no one else wanted, and ended up making pretty good success stories out of them. Our goal is to present you with a straightforward, easy-to-read how-to book about investing in rental real estate investing. Our book will teach you how to get ready to invest, find deals, negotiate, and purchase and manage rental properties. We will supply you with many of the tools, resources & systems you'll need to get started, and show you where to find more resources when you're ready. I've kept it free of hype and "get rich quick" talk. The real estate & investment books and resources I recommend are ones we've used and recommend. When we discover a new one, we'll add it. I believe you will get far more value from this real estate investment book and package than you paid, and we are willing to give you your money back if you don't agree. Just ask. That's the most "hype" sounding thing you'll hear out of me. In this book and package, we share everything we know about buying and holding single family homes & multi-unit apartment buildings; improving them, setting up systems & automating them, and of course: making the buildings profitable. We don't know everything, but after nearly ten years, we have a great collection of buildings, systems, and solid long-term tenants. Our plan seems to be working, and now we'll share it with you in such a way that you just might be able to duplicate it and even improve on it. Here's what people have said about our book so far. In addition to the real estate investment book, we also put together an add-on forms & documents kit that includes resources to help jumpstart your "side hustle". These are based on our own leases & documents that we've created over the years, with the help of our legal team and others. Here are some things you'll learn, and some things you'll get! Metrics: CAP rates, ROI, ROIE, CAGR, cash flow, etc. So take a few minutes and look around our website: We've posted some free chapters as well as a table of contents to help you get a "feel" for how useful and valuable this book and documents kit might be to you. We'll add more content as time goes on, and we're always willing to answer whatever questions you might have.